Motivated by a web-server model, we present a queueing network consisting of two layers. The first layer incorporates the arrival of customers at a network of two single-server nodes. We assume that the inter-arrival and the service times have general distributions. Customers are served according to their arrival order at each node and after finishing their service they can re-enter at nodes several times (as new customers) for new services. At the second layer, active servers act as jobs which are served by a single server working at speed one in a Processor-Sharing fashion. We further assume that the degree of resource sharing is limited by choice, leading to a Limited Processor-Sharing discipline. Our main result is a diffusion approximation for the process describing the number of customers in the system. Assuming a single bottleneck node and studying the system as it approaches heavy traffic, we prove a state-space collapse property. The key to derive this property is to study the model at the second layer and to prove a diffusion limit theorem, which yields an explicit approximation for the customers in the system. Aveklouris, A, Vlasiou, M, Zhang, J, & Zwart, A.P. (2017). 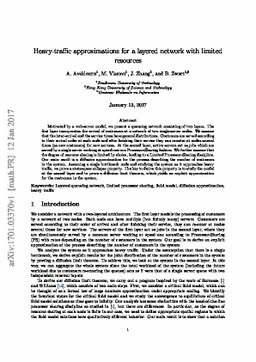 Heavy-traffic approximations for a layered network with limited resources.